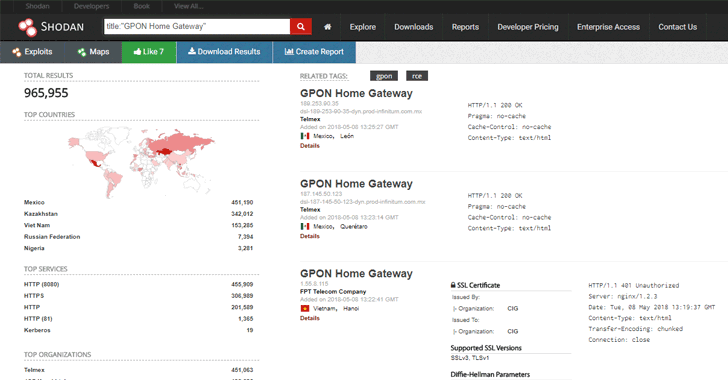 Since hackers have started exploiting two recently disclosed unpatched critical vulnerabilities found in GPON home routers, security researchers have now released an unofficial patch to help millions of affected users left vulnerable by their device manufacturer. If exploited, the first vulnerability lets an attacker easily bypass the login authentication page just by appending ?images/ to the URL in the browser's address bar. However, when coupled with the second flaw that allows command injection, unauthenticated attackers can remotely execute malicious commands on the affected device and modified DNS settings, eventually allowing them to take full control of the device remotely. Shortly after the details of the vulnerabilities went public, security researchers at Chinese IT security firm Qihoo 360 Netlab found that threat actors have started exploiting both the flaws to add the vulnerable routers into their botnet malware networks. 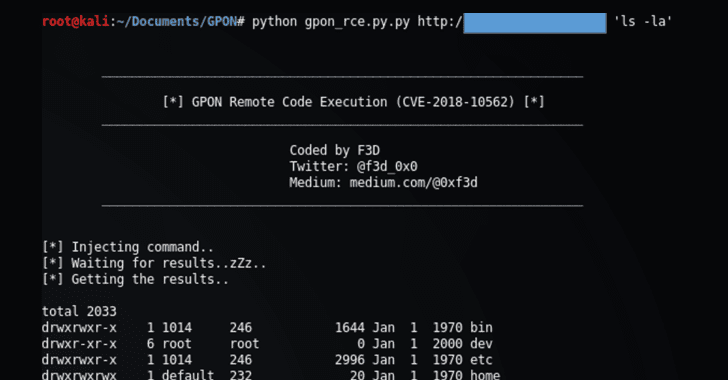 Moreover, a working proof-of-concept (PoC) exploit, written in python, for GPON router vulnerabilities has already been released on GitHub by an independent security researcher, eventually making exploitation easier for even unskilled hackers. The researchers even published a video demonstration showing how the attack works. Researchers at vpnMentor already reported the issues to Dasan, but the company has not yet released any fix for the issue, and the researchers believe that the patch is not in development either. What's worse? At the time of writing, almost a million vulnerable GPON routers are still exposed on the Internet and can be easily hijacked. However, even if there is no official patch available, users can protect their devices by disabling remote administration and using a firewall to prevent outside access from the public Internet. Making these changes to your vulnerable router would restrict access to the local network only, within the range of your Wi-Fi network, effectively reducing the attack surface by eliminating remote attackers. "It was created to help mitigate the vulnerabilities until an official patch is released," the researchers said. "This tool disables the web server in a way that is not easy to reverse, it can be done with another patch script, but if you are not comfortable with the command line we suggest firewalling your device until an official patch is released." To use this tool, all you need open this web page, and scroll down to the input form asking for the IP address of your exposed GPON router (local LAN address, not WAN), a new password for SSH/Telnet on your router. In a separate tab open your router's web interface using https in the URL and then press "Run Patch" on the vpnMentor to continue and apply changes. You can apply the patch to secure your devices, but it should be noted that it is not an official patch from the manufacturer and we do not encourage users to run any third-party scripts or patches on their devices. So, users should either wait for official fixes or apply changes manually, when possible.